I will say first up that most of the products in the new range are pretty good. I was very pleased to see mainly organic ingredients, with minimal crap in the foodie products. That was until I got to the protein snack. I was speechless. Well, not completely. There were words mumbled like acidity regulator? and caramel colour? alongside flavour? and CANOLA OIL?!?! SERIOUSLY!!... how is anyone going to get/become/maintain optimum health eating this crap? I'm not going to dissect every dodgy ingredient here as you and I will both get very bored very quickly. But I wanted to raise this as there are so many people out there that simply see a particular person's face and assume that whatever they are promoting is gonna be good. And I'm here to tell you don't judge a book by it's cover. This just ain't so. Whether the celebrity personality had a say in the ingredients in these products or just had their face slapped on the packaging to increase sales, I've no clue. But either way, shame on them, if health and proper eating is what they advocate. 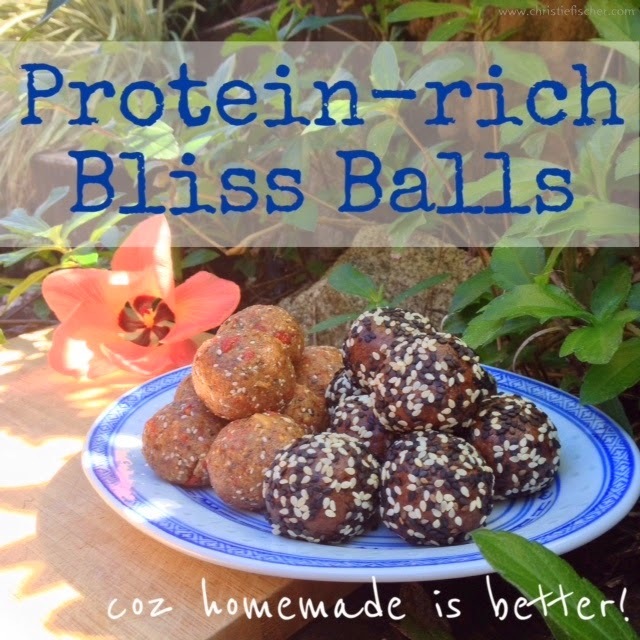 It's not hard to make protein bliss balls for the mass market. It's not hard to make them taste good. It's not hard to use quality ingredients that are actually FOOD. Like, to eat. Almonds. Sunflower seeds. Dates. Bam. You've got yourself a protein bliss ball recipe. Chuck 'em in a sealed packet, and they're gonna last. And if they don't last 3 years, do you really want to be eating them anyway? So I've come up with a recipe, two actually, just in the last day, yep coz it was really hard for me, and I'm giving it to you all so you can create something far more delicious (I'm taking a stab at this one as I couldn't actually bring myself to buy the above packet to try, for obvious reasons), far more nutritious (this I know for sure) and far better for you, your body, health, and consciousness. Pit and chop dates, add them to a food processor. Add the remaining ingredients and blend til combined. Roll into balls and then in sesame seeds for extra protein and crunch. And Bobs Your Uncle!! This made 8 bliss balls. This one has a few extra ingredients that aren't the usual staple ingredients most people keep in the pantry. But they are also delicious and highly nutritious, so I challenge you to go grab what you need and have a go! Pit and chop the dates and figs. Add them and everything else to a food processor and whiz until combined. Roll into balls and leave as is, or coat them in coconut flakes. This made 9 bliss balls. *The gelatin powder I use in my bliss balls is Great Lakes Gelatin Collagen Hydrolysate (green label) and it is unreal and incredibly nutritious. It is the same collagen found naturally in bones, skin, and cartilage and provides a pure protein (it contains 90% protein!!) that is very easily absorbed by the human body. This stuff is also amazing for our own bone's and joints, preventing age related cartilage damage and collagen loss. The difference between this and regular gelatin is the hydrolyzation process; this essentially means that this will not congeal so is perfect for rapid absorption at a physical level. And on a cookery level, it's tasteless and flavourless, providing only incredible nutritional benefits. It's the regular gelatin you need for jelly and marshmallows. This is becoming more and more popular so you might find it at your local health food store or cafe (I know the Paleo Cafe in Cairns stocks it in their retail section), otherwise it's easily available online. I hope this post has brought more awareness to you around store bought food. Not everything is as it seems and as much as a few pre-packaged snacks and treats are great when you can't be bothered, haven't had time, or are caught out and starving... there still are crappy ones that you should avoid at all costs, and much better organic made versions that pretty much are what you would make at home. So find those ones. A few good brands I know of are Simply Raw (probably the best on the market), Sweet Leaf in Cairns, Organic Food Bar, and Blue Dinosaur Paleo Bars off the top of my head. But it takes so little time to make these yourself, and if you double the recipe you've got enough for you and a buddy for a week! If you try one of these recipes please let me know in the comments below. Can't wait to try these recipes - always prefer to try something tried and true. In a pinch - I always travel with a 'Simply Raw' bar - I agree - definitely the best!!!! !